Purchasing IT hardware and software can be a time-consuming and bewildering task. With technology evolving all the time, specifications and compatibility issues can arise between your existing systems and anything new you want to buy. So when you need new hardware or software for your business, we help you choose from the hundreds of brands of anti-virus software, PCs, monitors, printers and any hardware of software you require at low prices. We can provide informed, impartial advice helping you make the right choice for all your IT systems because we have experience with what works best. Our vast knowledge means that we can source, supply and install the right products for you. 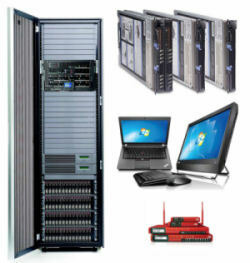 Computers, Laptops & Servers - As well as being able to supply all makes and models of off -the-shelf computers and servers from branded manufactures such as Dell, HP and Toshiba we can also customize your servers and computers to a specification you require, giving any needed advise along the way. Network Devices - We can supply all makes and models of a vast range of network devices such as routers, access points, hubs, firewalls, network cards, cabinets, network storage, patch leads and any related network accessories. Printers, Scanners & Copiers - We can supply all makes and models or printers, from small desktop inkjet printers to larger lasers printers with multifunction capabilities. Peripherals & Accessories - We can supply all makes and models of a range of peripherals and accessories such as, cameras, monitors, speakers, KVM, projectors, mice, keyboards and much more. Whatever your needs we can advise and source based on your requirements. Toners, Cartridges & Consumables - We can supply all makes and models of printer consumables. Components, Spares, Cables & Adaptors - We can supply any cables, spare parts and components such as graphics cards, memory, hard disks, and many spare parts for use with your existing computers and devices. Licensing & Renewals - Licensing can be a complex and time consuming issue with an organisation. We can provide you with accurate licensing quotes and subsequently manage your renewals so you have an easily manageable software inventory, ensuring you stay within the law and don’t get hit with heavy fines that come with using unlicensed software. Operating Systems - Do you require an updated Windows or similar operating system for your computer or server? We can supply all operating systems to match your requirements, we can then also offer a full installation and upgrade service to install your up to date software. Application & Utilities - Need Microsoft Office or Adobe Acrobat? If you need a utility or application for a certain task, we can advise and source a suitable title for you. Should you need to discuss any of these services, have questions or if you require a quote, please give us a call at 902-462-3249 and we will be happy to assist.